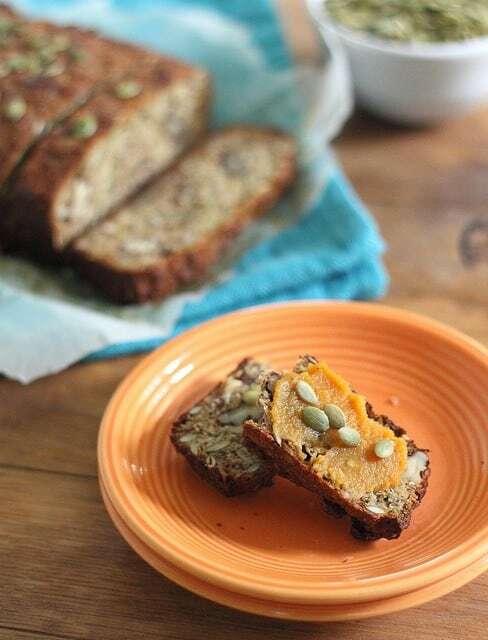 This pumpkin seed nut bread is a hearty, chewy and dense bread great for a high protein snack. This is not some fluffy, melt in your mouth, sweet kind of bread. This is a bread that will put hair on your chest. But seriously, this is a bread with some legit chew factor. It’s nutty, seedy, hearty and makes for an awesome pre or post workout snack. I’ve had a really good 4 days back at crossfit this week after almost 2 weeks off while in Italy and I’m thanking the bread. It’s been my go to “I’m so hungry but if I eat a real meal before crossfit I’ll puke” snack come 5pm every day. Because clearly the bread is everything and the fact that I had 2 full weeks of rest has nothing to do with it. It’s funny because a month ago I promised not to start the pumpkin thing too early and so even though I had already opened a can of it for myself, I refused to post anything pumpkin related until October. Then I go away and avoid the internet for 2 weeks, accumulate over 500 unread posts (omg, anxiety attack) in my reader and like 300 of them have “pumpkin” in the title. So without ever having even made something myself for the blog, I’m sick of it and have no desire to get all pumpkinified on you. Seeds, however, seem different enough to not annoy me and fit with the whole fall “must do pumpkin” thing. And if you miss the actual pumpkin, spread it on a piece of toasted bread and call it a day. Preheat oven to 340 degrees. Line a loaf pan with parchment paper and grease with baking spray. In a food processor, pulse half of the pumpkin seeds until finely chopped and almost a "meal-like" consistency. 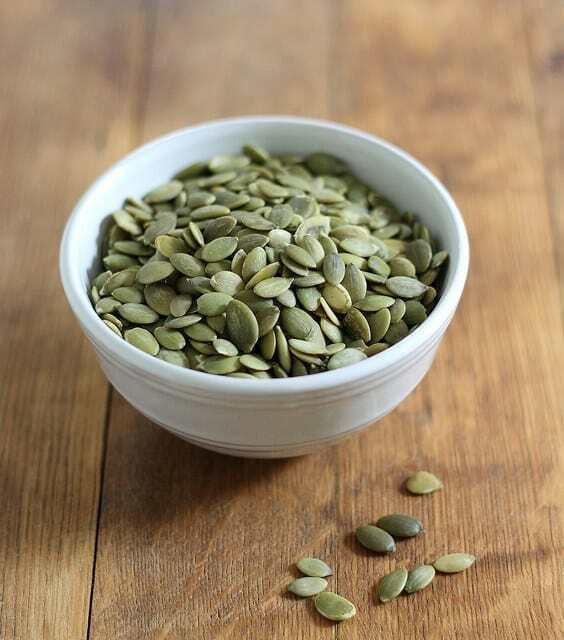 Combine all dry ingredients including pulsed pumpkin seeds in a large bowl. In a small bowl, whisk together remaining wet ingredients. Add wet to dry and mix until incorporated. Pour batter into loaf pan and spread evenly into the corners. Bake for 45-50 minutes or until fully cooked through. Remove from oven, pull the bread out by the ends of the parchment paper and transfer to a cooling rack. Slice and serve once cooled. This is not a sweet bread. If you like things sweet, add extra honey to the recipe. I want bread that puts hair on my chest! 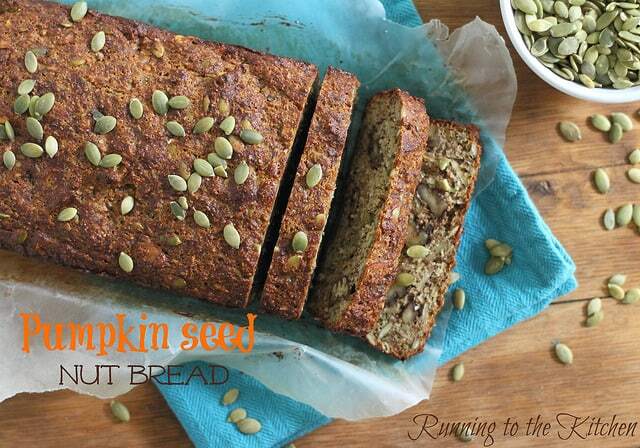 J/K I love these kind of hearty nutty breads!!! I have to make some over the weekend!!! Yum! I’m all about the hearty and dense breads! This one looks like a keeper! that looks delicious…esp when I compare to what I made last night. Perfect way to kick off pumpkin season! 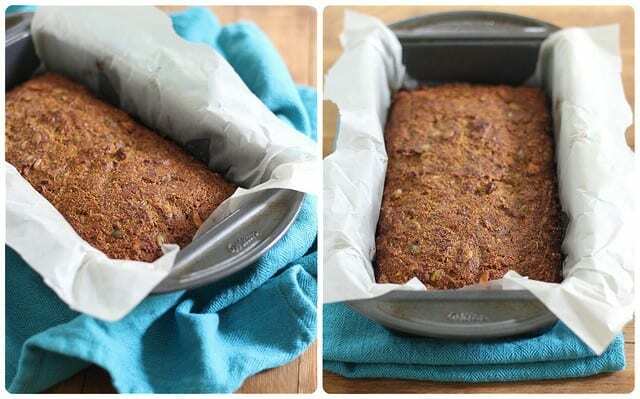 OMG, I am so excited to make this paleo bread! It’s looks AMAZING, you’re the best! I love the last pic with the puree and the seeds and the bread. You’ve got the bases covered! Sounds very hearty! Love it!! I really love how dense and hearty this looks, perfect snack when hunger strikes. I am constantly impressed by your paleo baking! This bread sounds so chock-full-of energy, love it. any idea wht the fat, calorie, carb, fiber count is in this per serving? No idea. Sorry, I don’t calculate nutritional info on my food. There are plenty of websites out there that do though if you want to plug the recipe into it. I know sparkpeople.com has a decent one.